For those of you new to my blog, welcome! This is a series I do every Sunday. It’s where I use a polish from my collection that I have never worn, for whatever reason. It’s a way for me to use my polish, not just look at it, but wear it. I hope this inspires you to take a look at your collection and maybe wear one you haven’t. You’d be surprised at the gem you might find! 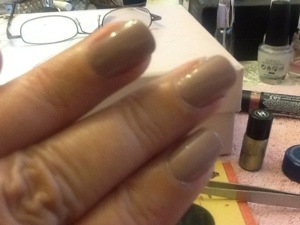 Today I have on demure vix by Essie. I bought this polish months ago at Ross. It was $1.99, a price not to be passed on. I also bought some other Essie that day including sand tropez, nice is nice and coat azure. These were all from the Spring 2011 Essie collection. I really like this color and I think it is on trend for this fall. Seems like this fall it is all about the nudes and deep maroon colors. 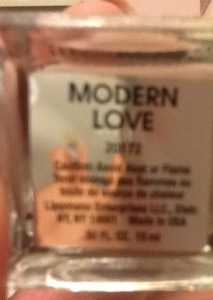 This color is also very reminiscent of a new polish from Deborah Lippmann called Modern Love. The photo below is Modern Love. demure vix is more purple but it has as much depth and dimension as Modern Love. I like them both. demure vix has a slight shimmer and a slight purple/rose duo-chrome, which adds to the interest. What is it with Essie polish and their formula? Essie is like a box of chocolates, you never know what you’re going to get!Thanks for the quote, Forest, This started out fine, then in the middle of painting a nail a huge drop would find its way down the brush and onto the nail. So then I would take off as much polish as possible and it was streaky like no other. 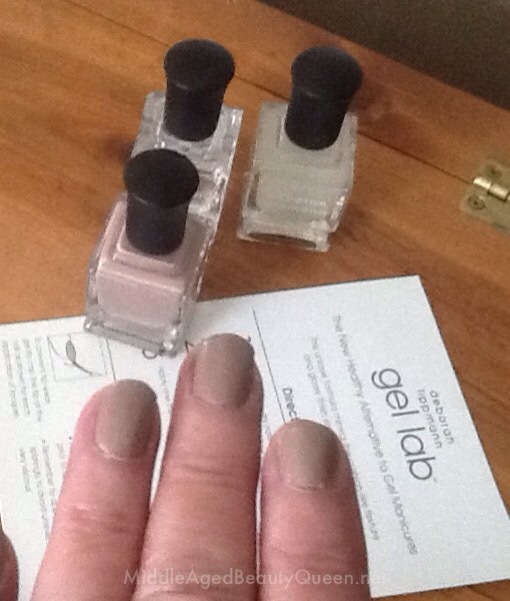 It wasn’t a difficult task to paint my nails but I don’t like that globbing thing this polish does. I think goopy is almost better than this. Especially when I was on the last coat, I did not want any globs! I guess that is the charm of Essie? I would give this polish 4 out of 5 stars. 4 might be pushing it because of the gooping, maybe 3.5. You guys know what I’m saying. I do love the color, I love the price, just not the formula. All that being said I might just wear this one for a few days! 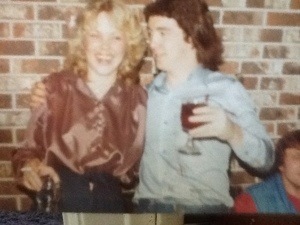 This is me and my “boyfriend” circa 1977-79. Can you see how skinny I was in my size zero jeans? I thought I was fat and my “boyfriend” would always tell me I should do sit ups and go jogging to get off the extra weight. My “boyfriend” would order for me in restaurants, he would get me the dieter’s plate with cottage cheese. When I look at this picture today I am SOOO glad I moved back to Idaho in 1979 and away from the crazy “boyfriend”. I also wonder what the “boyfriend” looks like today. Somehow I think he is pretty much bald and overweight. I must tell you right off the bat, this is my very first Deborah Lippmann polish, EVER !. Can you believe it? For some reason I have never bought a DL polish. I love her polishes, I love her story, I follow her on Twitter, I watch her on HSN, I read every article about her, but just never bought her polishes. For one thing, she is known mostly for glitter polish. The Queen of Glitter would be Deborah Lippmann. The Anti-Queen of Glitter would be me!. Ha! I would through everyone with glitter polish on their nails in the dungeon. They can wear it on their toes, but not on their nails! There, I said it, I don’t like glitter nail polish. I think anyone who knows me already knows this about me.
. please note: I did not take this photo. This was taken from the Nordstrom website. 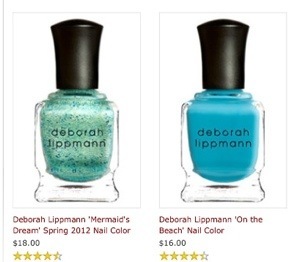 Mermaid’s Dream and On the Beach were instant hits and from there summer began, with the turquoise color, not tangerine as stated by Sephora and Pantone. Although, I will say there was a ton of coral out there this summer, to go along with the turquoise. Back to the reason I bought a DL polish. I have been working all summer on a comparison of nail polish by brand. I have been using the criteria of cost, dry time, wearability, stain/no-stain, formula, VNL, size of bottle, bottle design and removal. I have tested Revlon, Chanel, illamasqua, Dior, Sally Hansen, wet n wild, essence, Barry M, Catrice, Gosh, Essie, Julep, CND, Mac, Nails Inc, Sephora by OPI, Ciate, butter London, Models Own, OPI, China Glaze, Orly, Zoya, Borghese, Megan Miller, Color Club, Cosmetic Arts, Venique and L’Oreal. What is missing from this list? 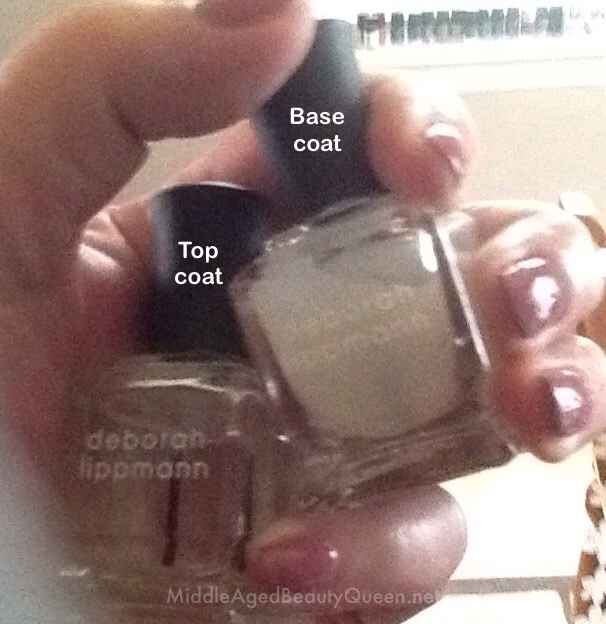 Deborah Lippmann. So now I had a reason to buy a DL polish. To some this may seem a boring beige, and to be honest my first thought was “mannequin hands anyone?”. But, after wearing this polish for a few days I have come to love it. It has a lavender undertone to it, and the slightest bit of shimmer, when the light hits it just right it glistens beautifully. This is a gorgeous polish, and I’m going to even say this is in my top 5 favorite polishes. Okay, okay I know my top 5 really has about 12 polishes in there but this deserves a spot in the top 5. It is that pretty. I really like my very first Deborah Lippmann polish purchase. And I will be going back for more.